Make my own mincemeat? What on earth for? I can hear you cry. Well, to impress and show off, of course. And, once you’ve eaten a mince pie with homemade mincemeat, you’ll never eat another shop bought again. Guaranteed. It’s getting on for that time of year when it’s difficult to avoid the mince pie – you know those utterly dry, weird tasting things that are supposed to sum up the Christmas spirit – I think they actually sum up the Scrooge sort of Christmas spirit – mean and grumpy. I am on a mission – to introduce you to a great tasting, moist, spicy delicious Christmas produce. I need a little work on your behalf. It’s takes so little preparation, and it is so worth it! And if you are inspired, why not make our Christmas cake too? So, beg or borrow some windfall apples or buy some, get some decent glass bottling jars , assemble a few ingredients and we’re off! Once you’ve made the mincemeat and are ready to use it, make your favourite shortcrust pastry, roll it out fine and cut into circles. You can make mini ones too – great for parties. Check the fruit over to ensure you're not including any stalks or branchy bits. Put all the ingredients together in the large mixing bowl. Mix thoroughly. Leave to soak for a couple of hours or preferably overnight. Wait for 3 weeks before using. This lasts for ages and ages. Keep in a cool cupboard. * Suet is a particularly British thing. If you can’t find it you will need some shredded beef fat. Last updated by Bread Baker Danielle at November 26, 2014 . 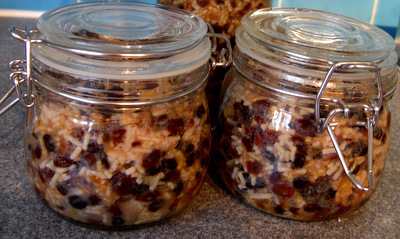 Love making mincemeat… although mine tends to be alcohol free to make it good for all! 🙂 I replace brandy with spiced apple juice (I infuse the spices for mulled wine in hot apple juice) and also do not use suet–I prefer not adding any fat apart from a spoonful or so of dairy free spread just to make it moist! I also make an alternative filling with cranberries, satsuma and macadamia nuts for those who like my other half profess to not like mincemeat, but this filling always goes down well with those who like it and those who don’t. Top tip, after filling pie with mincemeat put a blob of Philadelphia (full fat natch) on top before putting the pastry lid on. An absolute joy beholds! Also put orange zest in pastry, you can’t go wrong, trust me! I love mincemeat, and for the first time last year I made my own! You’re right I wouldn’t go back to the bought stuff now. I already have a rhubarb and ginger mincemeat I made back in August, can’t wait to try it. The only thing I would add is that if the idea of suet puts you off you can leave it out of the mix and then just add a tiny splodge of butter to each pie before cooking.